On this page I am sharing Free Printable Advice for the Baby Cards in three different colors. These cards are not a game but a keepsake. The mom-to-be can either put these cards inside a time capsule with a newspaper from that day and other things or just keep these cards at some safe place and share with the baby when he or she reaches an age where they can read these cards and enjoy. It is better to print these card on a cardstock paper and cut these around the edges after printing these. How to Play: Give one card to each guest with a pen and then ask them to write an advice or wish for the baby that will be given to them when they are old enough to read. Collect all the cards and you can either choose to have no winner or the mom-to-be can read all of these cards and choose the best advice. Here are these free printable advice for the baby cards in blue color. These simple cards are only decorated with a heart. Just click on the thumbnail image and a bigger image will open up. You can print that image or save it to get it printed later. 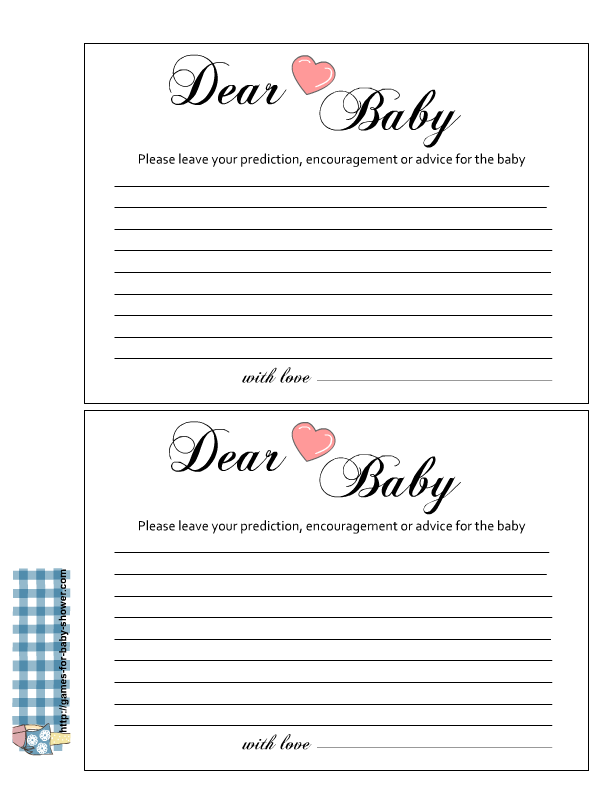 Here are these cards where the guests can write advice and wishes for the baby with a pink heart. You can use these cards on a girl baby shower. This is another printable image for these cards. These simple cards are decorated with a yellow heart.